"The Walking Dunes". Though many of my fine art landscapes are created hundreds, if not thousands, of miles from my home, "The Walking Dunes" was created in my "back yard"...right here on Long Island. 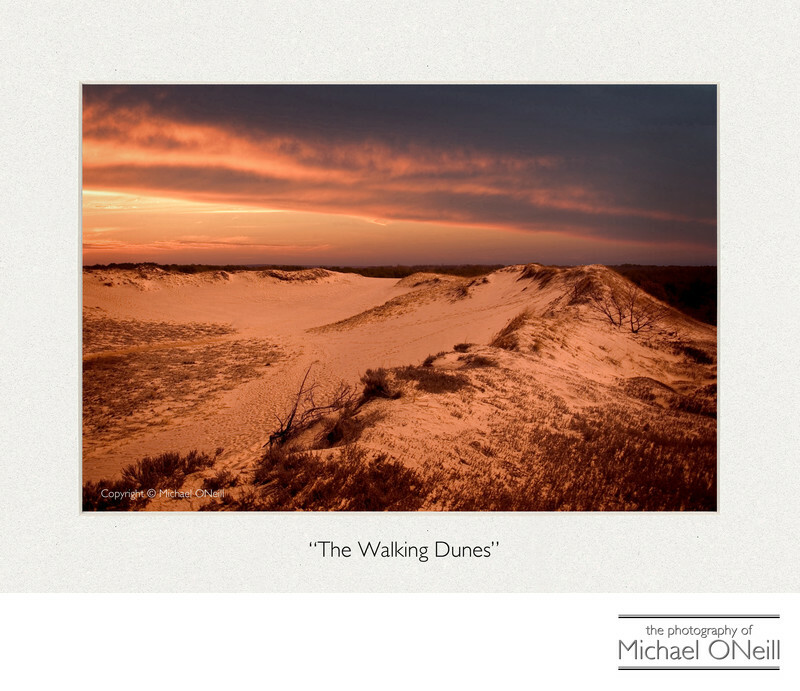 The Walking Dunes are located in Napeague, NY, a small village located between The Hamptons and Montauk Point on the south fork/east end of Long Island, New York. These impressive sand formations are ever-changing as they are buffeted with winds coming off the Atlantic Ocean on one side and Napeague Bay on the other. At times the dunes can drift to heights of 100 feet or more and the powder-fine sand makes it extremely difficult to traverse. As impressive as this natural wonder is, it is one of the best kept secrets in the area. 99.9% of the tens of thousands of visitors that trek to the Hamptons and Montauk each year have never even heard of the Walking Dunes. There are no signs to mark it’s location and they don’t appear on any map that I’ve ever seen. The parking area on the western end of the dunes is only large enough to accommodate a half dozen cars. Because of it’s obscurity this fine art photograph of the Walking Dunes is not as popular as some of the others in my body of work. It does have special appeal to fine art photography collectors from The Hamptons and the east end. All of the copies of this print that have been acquired were snatched up at local art galleries and open-air art shows on the east end of Long Island.